Snacks for Babies and Toddlers. 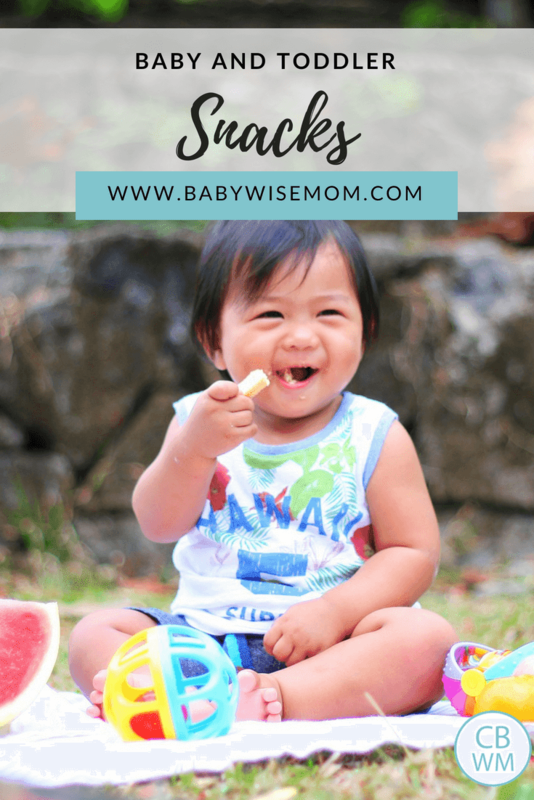 Snacks for babies, snacks for toddlers, and good rules to follow for snack time at your house. Snacks seem innocent and simple enough, but you can easily feed snacks in such a way that you develop bad habits. The irony in this is that up to this point, you have worked hard to develop consistent eating patterns and habits. 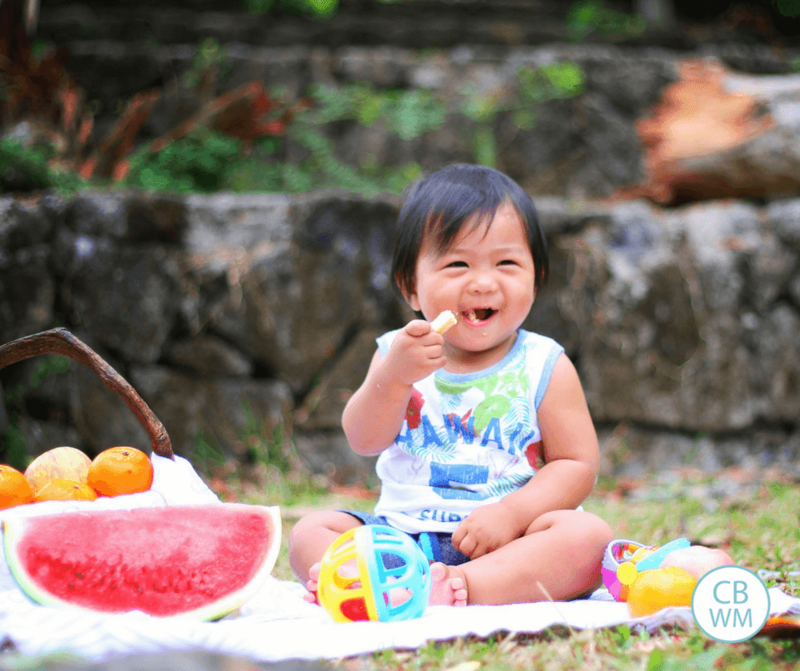 Just as “snacking” throughout the day as a baby negatively impacted sleep, the same can happen for older babies and toddlers. Here are some snack thoughts for you. The only snacks my kids have ever had under the age of one was when they ate finger foods. I have them eat finger foods while sitting at breakfast, lunch, or dinner with the family. This is always after they have eaten their own meal; you don’t want their appetite affected. “You will spoil your dinner!” Kaitlyn eats lunch, then Brayden and I eat lunch and she has her finger foods. It is immediately after her lunch, too, so that we don’t start a “snacking” habit. It is also feasible to feed your baby snacks while you are out and about. For example, you go out to dinner. 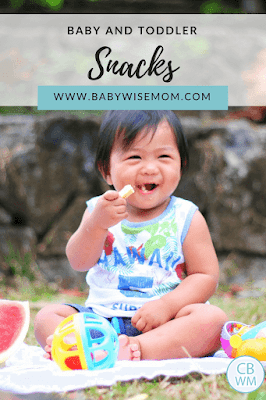 Snacks can be a good way to keep baby happy through the meal. Or you are at church. I use little snacks to keep Kaitlyn happy there. She doesn’t sleep at all, so a little snack can keep her quiet. These are examples of your routine serving you rather than you serving your routine. Also, these are moments of exception rather than rule. See the Finger Foods post for more thoughts on those. One is that your child has moved to eating meals with the family and dinner time is too late for him. In this case, your child would get up and have an afternoon snack to tide him over until dinner. With Brayden, I just gave him milk. You can do what you feel is best. Keep it light–only enough to make it. You want him to eat with the family. As your child gets older, the need for this snack should diminish, but the timing will depend on your child and your dinner time. Another is that you have dropped the morning nap and your toddler needs a mid-morning snack. I have found this to be true of Brayden. He makes it fine between nap and dinner, but needs something between breakfast and lunch. He usually has two graham crackers or some apple slices…it isn’t much, just enough to keep him happy and amiable. Keep them light. You don’t want child to fill up on snack and then skip the next meal. He will then need another snack to get him to the next meal, and an undesirable cycle begins. Keep them nutritious. Use your own judgement. Put it into the routine. Have the snacks be a part of the plan in your day. This will help prevent you from turning to snacking as a norm. Read more in the post Snack Time. Next Post Poll Results: What age did you start CIO (approximate)?